There is no such thing as paranoia. Your worst fears can come true at any moment. One of the great things about being a photographer is the complete control that you have over subject matter and something that I like to do when presented with the opportunity is to get out of my comfort zone and photograph something that I am not comfortable with. 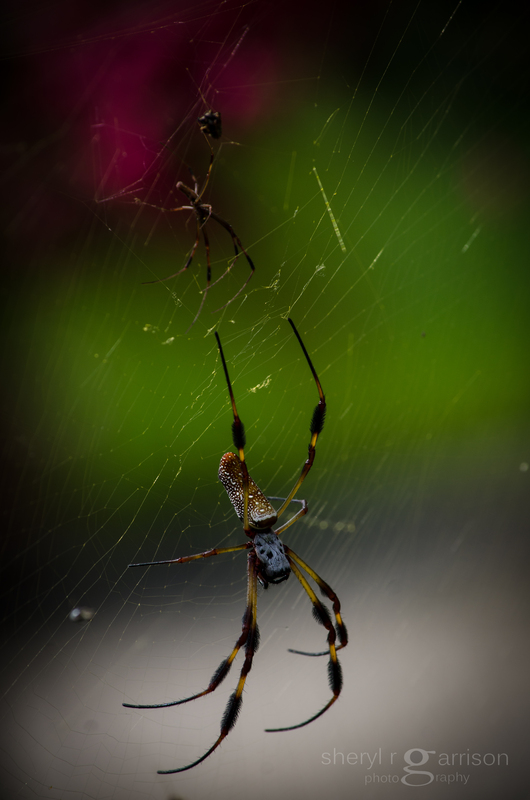 While on a recent trip to Florida I came across this largest of North American spiders with the exception of the tarantula, the banana spider. I did in fact shudder but taking a deep breath I began to photograph her with what looked like her offspring. While this spider is venomous, its bite is not fatal, at least that was what I kept telling myself as I moved around her trying to capture her and the color in that beautiful golden web. In the interests of full disclosure I will admit to using a telephoto and NOT my macro lens for this shot…after all these spiders are large with a body size of 1-3″ and leg spans of up to 5″! I can make a mental check mark beside venomous spider now, what’s next you ask? Gulp…a snake? One of my very favorite spiders! And the smaller spider above her is probably her consort/dinner…the line between those two is very thin! I remember seeing some of your spider shots and am trying to get better about them! I somehow missed seeing this post when you first sent it out. Spiders, snakes… I saw a boomslang today (tree snake) – heart skipped a beat even though I know they’re extremely reluctant to bite you. I haven’t yet been calm enough to point my 25mm at one, though (and somehow doubt I ever will). Please don’t, not worth the risk!